A secure and comfortable ankle rig, the Ritchie Leather Kahr PM9 Ankle Holster features a 1/2 inch thick felt pad and a 2 inch velcro strap. 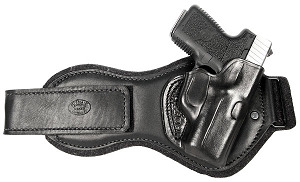 Designed for comfort, durability and a positive fit, this ankle holster can be used for your back-up gun or your everyday carry weapon. Right Hand.